Labour's Ed Miliband says he agreed to an interview with comedian and political campaigner Russell Brand to liven up the election race. "Some people were saying the campaign was too boring so I thought it would make it more interesting," he said. Brand has repeatedly urged young people not to vote, saying elections change little and that direct action is a more effective tool for "revolution". David Cameron said he "did not have time to hang out" with Mr Brand. News of the meeting emerged after a picture of Mr Miliband leaving the comedian's house in east London was posted on Twitter. In a preview of the interview, Mr Brand and Mr Miliband are seen discussing the low tax rates paid by some companies, with the Labour leader telling the comedian "people share your outrage about companies that don't pay their taxes". But he also addresses Brand's anti-politics stance, saying: "You've got to have a government that's willing to say there's something wrong with this and we're going to deal with it." The Labour leader insists "there are ways to deal with it". The full interview is expected to be posted on YouTube on Wednesday. Mr Brand, a comedian and actor, has become a high-profile, alternative voice on the political scene, campaigning against inequality, benefit cuts and corporate tax avoidance, and speaking up on behalf of the rights of housing tenants. Political parties are often keen for well-known faces to sprinkle stardust on their campaigns, while some celebrities go a step further and run their own - with mixed results. Brand hit the headlines in 2013 when, in a Newsnight interview with Jeremy Paxman, he said he had never voted because of "absolute indifference and weariness and exhaustion from the lies, treachery and deceit of the political class". In the same interview, the actor called for people to shun the ballot box and pursue a "revolution" against the political elites. Speaking last week, Brand said people should be "more aware" about politics but claimed the general election was "irrelevant" and "dead". The Labour leader defended his decision to meet Brand, saying he had been asked for an interview and he had been "happy to accept". While he disagreed with Brand's views on voting, he said the fact millions of people had not registered to vote was a sign that they did not believe the political system made a difference and politicians had a duty to try and persuade them otherwise. Media captionDavid Cameron: "Ed Miliband, hang out with Russell Brand, he's a joke"
"There are millions of people in our country who are not watching this election, who are not listening to this election and who think voting doesn't make a difference," he said. "The danger is that politics is being played in an increasingly empty stadium and if we don't recognise that and if we don't engage in different ways with the people that aren't engaging with this election then we'll have fewer and fewer people voting." When asked whether he would also be meeting Brand, David Cameron was scathing about the prospect. The prime minister said the comedian could be funny when urging people not to vote but added that he "profoundly disagreed" with him - saying people's jobs and the future of the country was "no joke". "His whole view is 'don't vote, it only encourages them', or something," he said. "It's funny but politics, life and elections and jobs and the economy are not a joke. 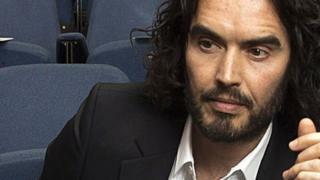 "Russell Brand is a joke... This is not funny, this is about the election, our future… I haven't got time to hang out with Russell Brand. This is more important." In response, Mr Miliband suggested his opponent's comments showed he was "totally out of touch with what's happening in our country". Nigel Farage, who clashed with Brand on Question Time earlier this year, said he regarded him as an "entirely negative influence on British politics". Speaking in Hartlepool, the UKIP leader said: "I think to say to young people you should not vote is shameful. "He has got a lot of followers, he is a big celebrity and he has been very successful in his own field and there's no denying that, but to say to young people 'Don't engage in the political process, it's all a waste of time' - people fought and died so we could be a democratic country, women chained themselves to railings so they could get the vote, and here comes a celeb saying to impressionable youth 'It's not worth engaging with', and I think it's really wrong." Analysis: Change from the outside?